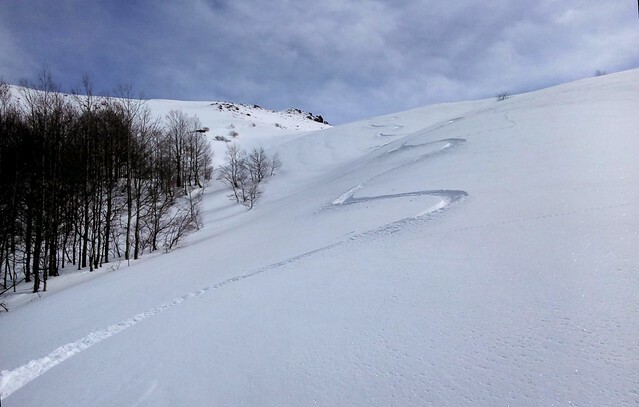 Warning: unless you’re really going to ski in Muş, there’s probably way too much boring detail in this post. Just skip the text in that case, and check out the photos. I think there are some decent ones. A number of years ago in the summer I was on a bus that made a brief stop at the bus station in Muş. I got out, looked around, and was amazed to see such high, not-too-steep, north-facing mountains so close to the city center. 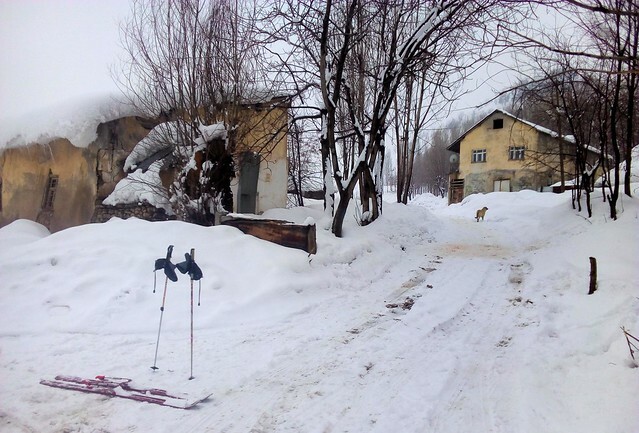 I thought, “I bet you could come here in the winter and backcountry ski directly from the city!” Back in Antlaya, an internet search revealed… nothing. 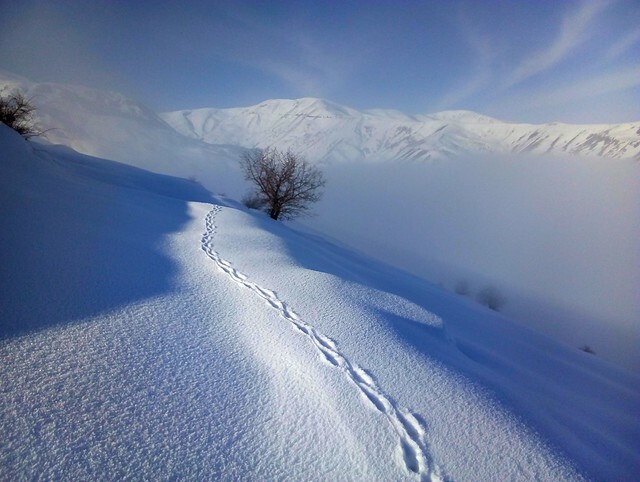 Asking around to friends, acquaintances, and even ski touring guides in Turkey also revealed… nothing. 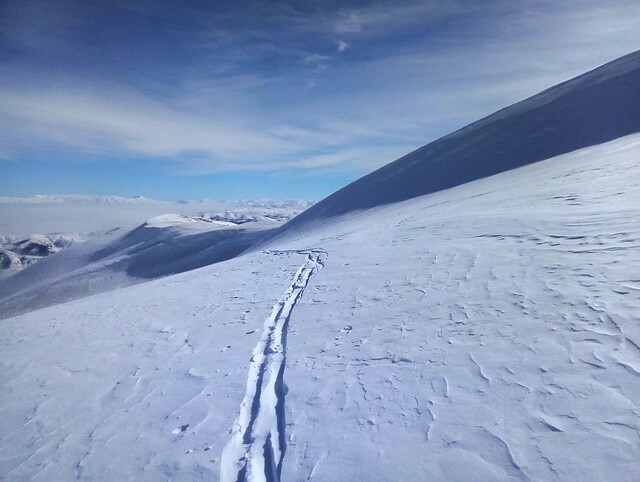 That’s why I figure there’s a need for a backcountry ski guide to Muş. 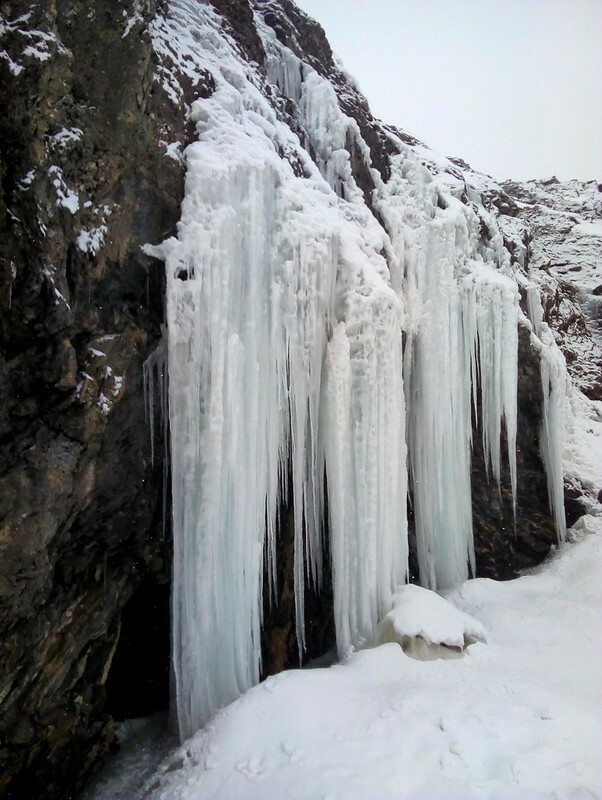 Unfortunately, for three of the four days that I skied in Muş the visibility was very poor so I was able to explore (and see!) less than I had hoped. 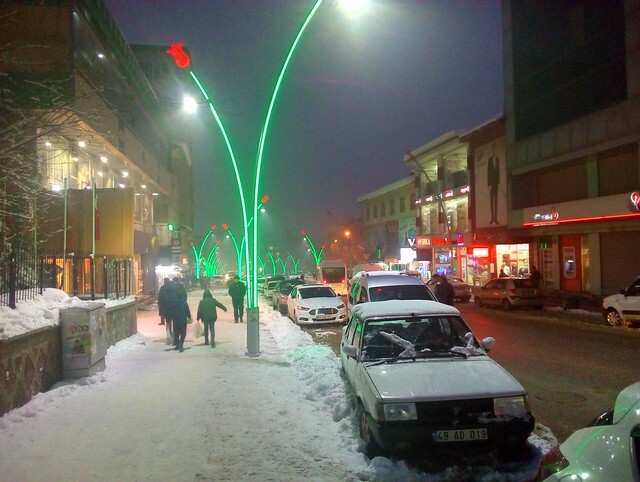 Muş isn’t your typical ski town. It’s a working-class city of 100,000 people where a tourist walking up and down the main street with skis is a bit of a novelty. Depending on where I started it was a 1.5-3km walk from my hotel before I put my skis on. For ease of carrying through the city I had my skis and poles in a bag. Some people correctly guessed I had skis in the bag while others thought it was a gun — it was about an even split! and always busier in the afternoon and evening. 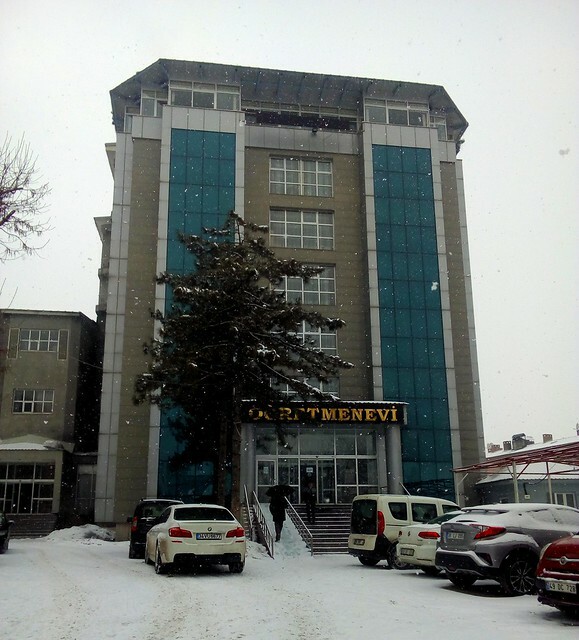 As Muş isn’t a typical ski town the Öğretmen Evi is not a typical ski lodge. 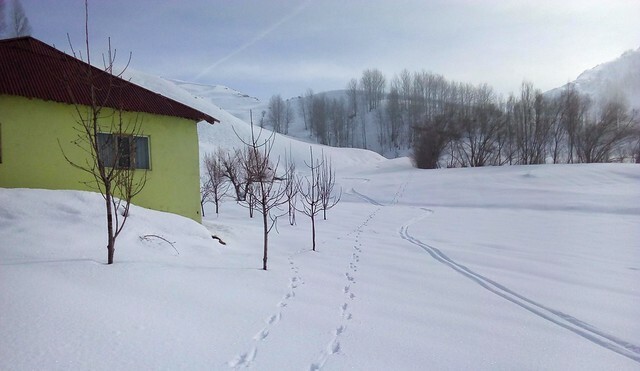 Although there are cheaper and closer-to-the-skiing places to stay in Muş (Şehır Palas, e.g. ), check the heat situation carefully. The Öğretmen Evi had 24-hour hot showers and heat which made it easy to dry my stuff every evening. They had a decent breakfast too. 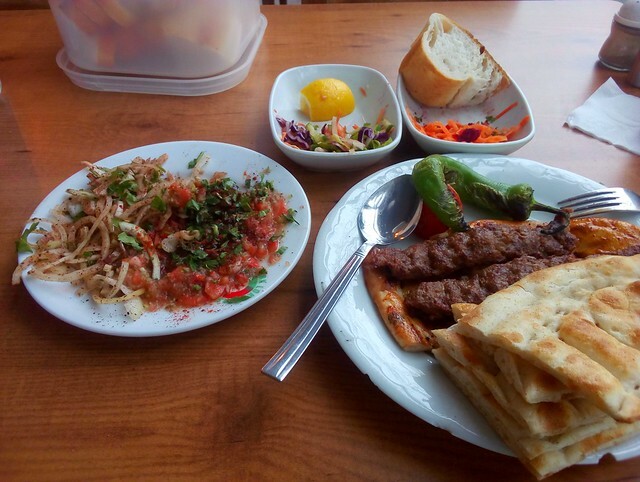 It seemed like a good value for money (70tl/night with breakfast in a private room with attached bathroom). 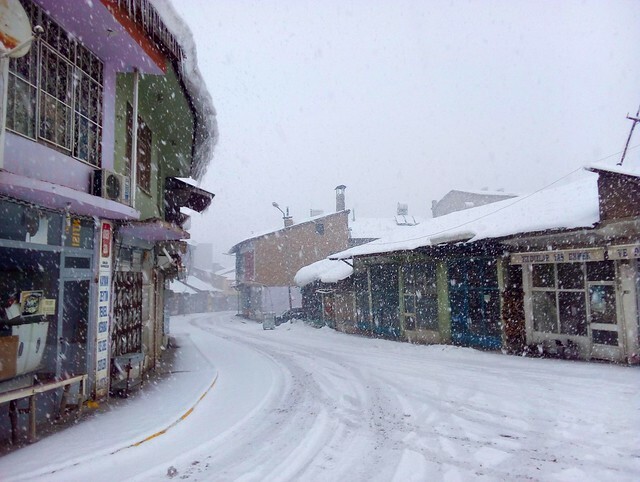 Muş isn’t very high — 1400m, but the mountains rise up to 2700m above the city. It snowed about 50cm during the four days I was there (and apparently has continued to snow a lot since I left). However, especially as you get lower, it can be very warm and wet so drying my gear out each evening was important. Note that you cannot cross that river without a bridge. Also note that there’s yet another bridge across the main drainage another km higher. The useful thing there is that there’s also a bridge to get across the side drainage there (providing access to the 2nd and 3rd ridges). The place to ski seems to be the three prominent north-south running ridges and the drainages between them. Again, because of the weather I didn’t explore as much as I wanted to. In retrospect I can see that I was quite lucky with the weather on the first day. I used the lower bridge to access the first ridge and skied out of the clouds that shrouded the city that morning. I made it up to 2600m, the high point of my four days in Muş. It was clear enough to get a bit of an idea of the mountains, where it might be possible to ski, and where the avalanche danger might be. 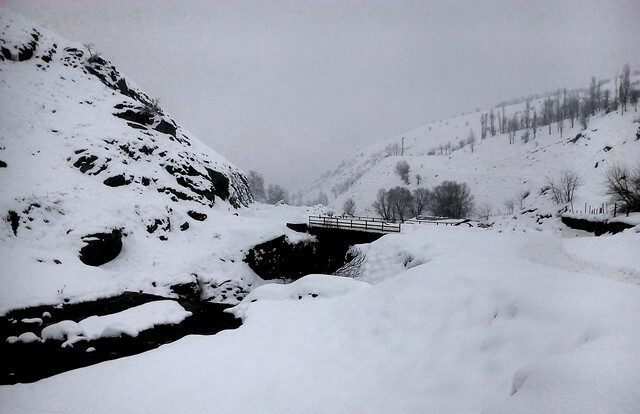 This year was a low snow year for Muş. The snow was too wind-blown up high to be any good, but I managed to find some decent snow as I went lower. I ended up in the deep drainage in the center-right of this photo (below). I could see this day that it looked like potentially good skiing to skin up out of that drainage to the right, cross the ridge, and ski down from there. However, I didn’t have all the bridges figured out at this point, and in the interest of being conservative I went left and took the shorter route back to the city. Unfortunately the weather didn’t give me another chance to get back up here. Seeing this house from above gave me confidence to ski all the way down here, and that’s when I found the higher bridge to cross the river and get back to the city. On my second day I used that higher bridge to access the second ridge. Here’s the lower part of the second ridge. Visibility got quite poor as I went higher. I made a mistake going left of the main ridge, got cliffed out, and had to ski back down to the right. 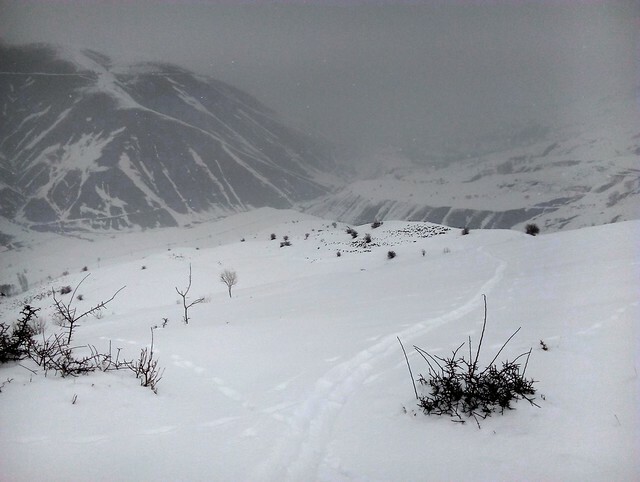 I crossed some steep slopes and before gaining the ridge again found myself in a whiteout. I came across cliffs, avalanche debris, and the slope I was on kept getting steeper and steeper. I had no idea what I was getting into, got scared, and turned around. I crossed the avalanche path, found a safe spot on the ridge, and calmed down. 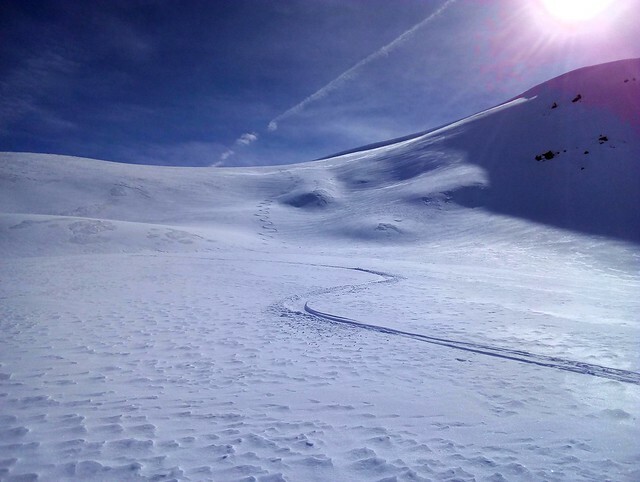 Then I made the decision to try skiing down the drainage since the visibility was too poor to ski the open slopes. Indeed I did make it through there, but note that the skiing is poor, and I needed lots of snow bridges to cross the serpentine creek many times. I crossed avalanche debris a few times as well. After my day two adventure I wanted a mellow day three. Before the Armenian genocide of 1915 the population of Muş was half Armenian, and there were some beautiful, large Armenian monasteries and churches in this area. However, most of this cultural heritage has been throughly destroyed. 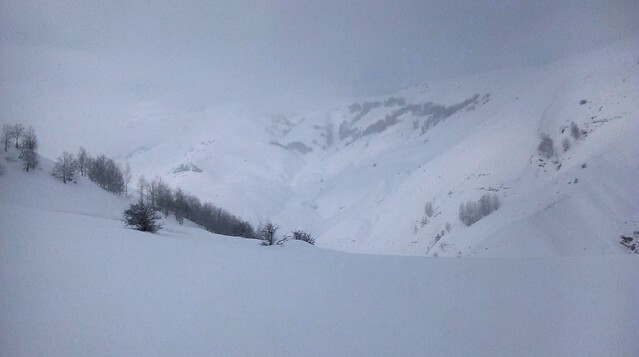 I could see on the map that it looked possible to ski to one ruined monastery, the Arakelots Monastery, in an area that’s otherwise inaccessible in the winter. I was concerned a bit about the 200m final steep descent to the monastery on an ESE-facing slope, but I figured I’d deal with that when I got there. It turned out to be a good plan for the day, but I never made it to the monastery (so I can’t tell you how much is left). 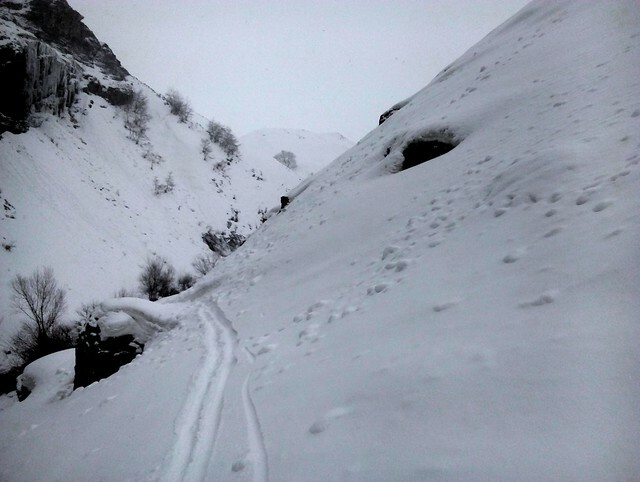 I skied up the first ridge for the second time and then veered off ESE toward the monastery. The poor visibility made me concerned about trying the cross the next ridge. 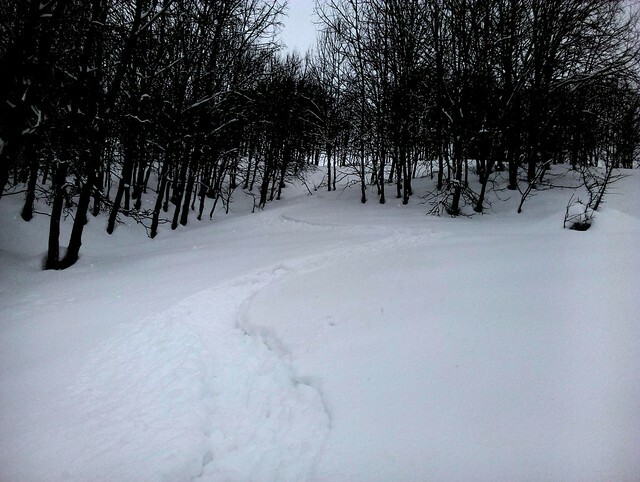 Shortly I came across a small forested area with seemingly excellent snow. It was a NNE-facing slope at 1800m. With the poor visibility I needed trees to do any skiing, and here they were with excellent snow to boot! The slope was only 150m vertical (actually I think the good snow may have continued much higher, but I couldn’t see anything), but I ended up skiing it four times. 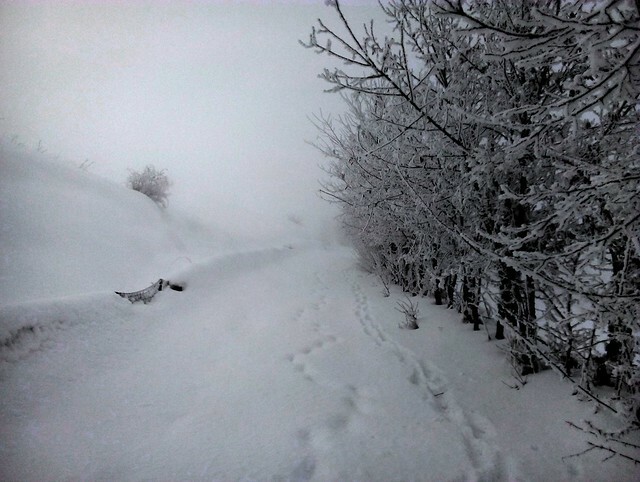 It was the best skiing I found in Muş. 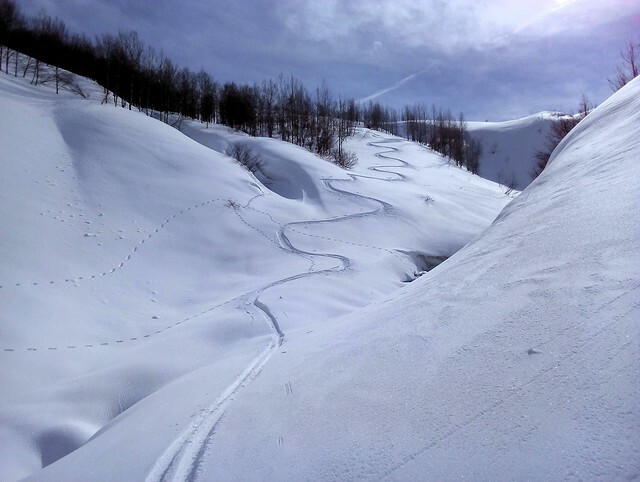 It wasn’t Hokkaido powder, but as these things go, I’m pretty picky, and it was good enough for me to ski four times. The snow was better than it looks in this photo. but that visibility lasted only five minutes. I found some trees at about 1750m, but it was really warm this day, and the snow was wet and gloppy. 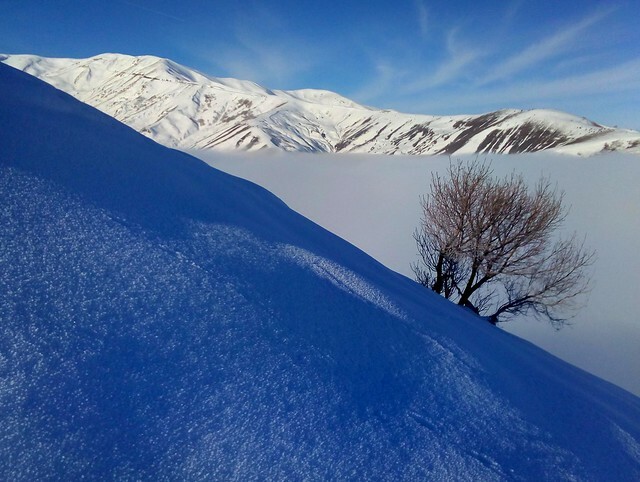 I headed back to town early and did some laundry so I’d be ready for the next week — skiing the Kaçkar again! 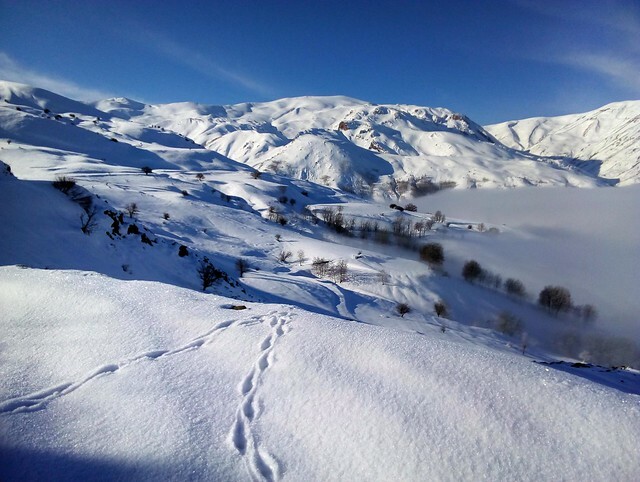 This entry was posted in Skiing, Turkey and tagged Muş. Bookmark the permalink. Nice! Beautiful pictures, as always.